Some plain flour for coating. 1 egg beaten + some milk for coating. Some bread crumb for coating. ~Check if the potatoes have cooked thru by pricking a fork into it. ~After the potatoes cooked, put in tap water to cool and peel it's skin. ~ Mash the potatoes in a mixing bowl. ~When is almost done, add in 1 Tbsp butter, some salt and pepper continue to mash. ~ Add milk gradually and mash/mix till it is soft and creamy. (check taste, add salt and pepper if require). salt, pepper and little sugar for seasoning. Add in minced beef, continue to stir fry till beef is cooked. ~ Mix in the beef/onion/mushroom mixture into mashed potato and combine well. ~ prepare 3 plates for flour / egg / bread crumb coating. ~ Using a Tbsp scoop a large portion of potato mixture put into flour. 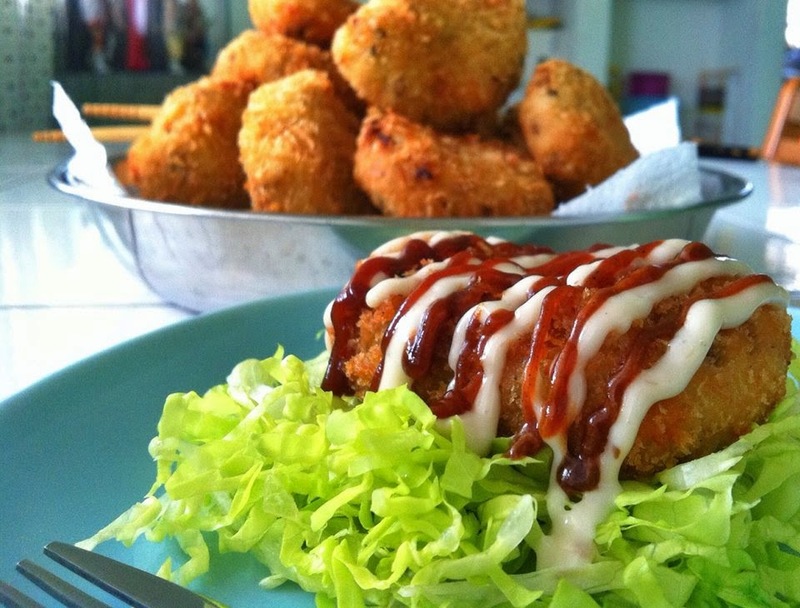 ~ shape/coat the croquette and pat off excess flour. ~ transfer and dip into egg wash.
~ coat with bread crumb, and shape the croquette. Make sure to pat tightly the crumb. ~ Send to deep fry to golden brown.